As a travel blogger, I love to sit down and watch DVDs that take me to far away places and introduce me to new sights and sounds. 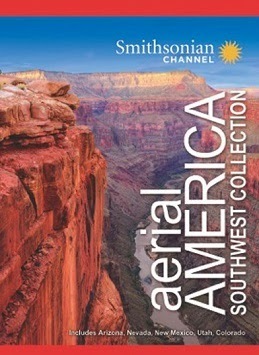 One such DVD is this brand new Aerial America: Southwest Collection DVD by the Smithsonian Channel. The DVD features 5 southwest beautiful states: Arizona, Nevada, New Mexico, Utah and Colorado. The approximate running time is 230 minutes. From: The Inception Media Group. 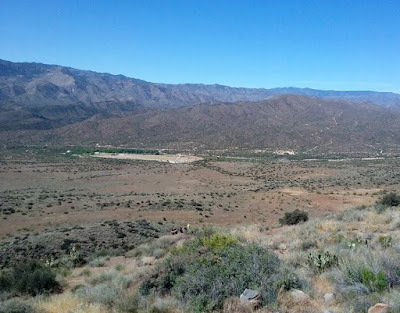 When I was a teenager, I spent several years living in Arizona and absolutely loved it! I guess that is when I officially caught the traveling bug. Almost every weekend my family went out on road trips across the Southwest. I remember visiting Sedona, Flagstaff, Scottsdale and many other location throughout Arizona. I especially loved visiting the old deserted ghost towns! The DVD starts with the great state of Arizona where the Grand Canyon is just one of the many magnificent marvels you get to explore. Throughout this episode you will learn about the Copper State's rich history, awe-inspiring landscapes, spectacular sunsets and the infamous gunfights that went on during the old southwest days. Next you will move on to the Nevada episode which I really loved! I have only ventured into this state 3 times and it was many years ago. In this episode you will discover the highs & lows of the state's rich history and how it became the land of big builders and even bigger dreamers. From the old mining towns and ghost towns to the Hoover Dam, there is definitely something for everyone who wants to learn more about this great state called Nevada. The third episode on the DVD will take you to the beautiful state of New Mexico. Out of all of the southwest states, I find New Mexico to be the prettiest. I am not sure why, but I do! During this episode you will explore some of the 121,000 square miles that make up this state. You will learn about many of the national treasures from the Rio Grande to adobe structures & dormant volcanoes of years' past. New Mexico is known as the Land of Enchantment and it is definitely that! The episode goes into the old cowboy tales, UFO sightings and more! Years ago I remember my family taking a trip to New Mexico to watch the famous hot air balloon races...this episode brought back all of those fond memories from that trip. Next you will move on to the Utah portion of the DVD. 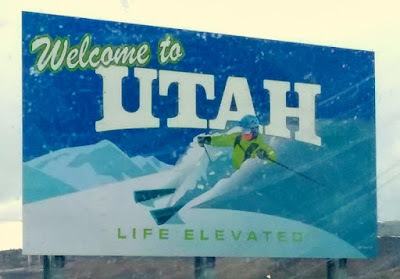 I have only been in Utah twice in my lifetime and I hope to return someday soon. Utah is known as the Beehive State, a land that offers endless surprises & possibilities. From the pinnacles of Arches National Park to the white terrain of Bonnesville Salt Flats and the tragedy of the Donner Party to the arrival of Bringham Young, the state of Utah has a lot to offer to travelers...young and old alike! Finally, you will end your visual traveling experience with the Colorado episode on the DVD. If you have never visited this great state, Colorado is known for having some of the highest peaks, tallest dunes and the largest single-site brewery in America. When I was about 15 years old...we took a trip to see all of the gorgeous Red Rock formations that are out in the dessert areas of the state. If you are into skiing, the DVD will explore a little bit of the ski slopes in Aspen too. Overall, I LOVE this DVD! I now live on the east coast and only travel out west once every 10-12 years or so. Yes, I know I need to visit there more frequently! Watching the DVD brought back all kinds of childhood memories for me and it was nice to relive them once again. In addition, I made a bucket list of all of the destinations that I want to see (in-person) that I learned about via this fantastic DVD. You can learn more by visiting the Smithsonian Channel online and by visiting Inception Media Group. You will find this brand new DVD release available for purchase starting on July 22nd, 2014.